Waterproof Overshoe with Superior Traction - Traction tread outsole and cleats simultaneously contact the surface, providing superior grip on ice, snow, and wet pavement. Weatherproof construction keeps shoes or boots warm, dry and protected even when slogging through snow, sleet, and slush. Reduce Slips & Falls - Full-sole coverage with heat-treated cleats on heel and forefoot provides full foot slip protection and traction throughout your natural stride. Easy On/Off - Extra-large gusseted opening designed for easy slip on/off over shoes and boots. Great for those who need to get about through winter's messy conditions without having to swap footwear. Durable - Proprietary sole design and rubber compound combine for superior strength, durability, and performance in the coldest winter conditions. 25 Replacement Cleats Included - Long-wearing, heat-treated replaceable cleats yield affordable, ongoing use season after season. 25 Replacement Cleats are included for maximum durability, performance and value. Made in USA - STABILicers have been made in Maine for over 25 years, reflecting the values of the parent company 32north and their commitment to quality, innovation and Made in USA products. STABILicers brand products are manufactured by 32north in Biddeford, Maine. Founded nearly three decades ago, 32north has a long history of innovative solutions for sure-footed traction footwear. Stability, traction and performance are hallmarks of the STABIL brand, as is their committment to Made in USA goods. All STABILicers brand products are Made in Maine, USA. 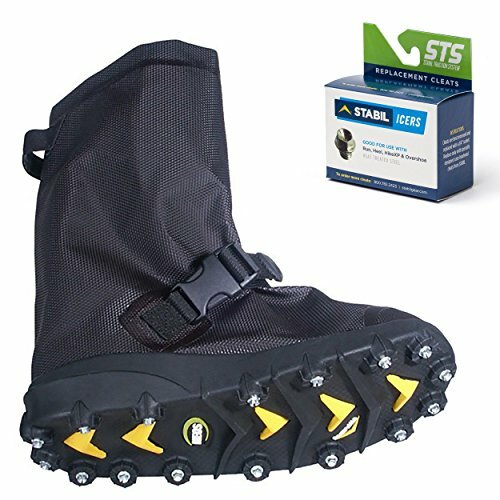 WATERPROOF WINTER OVERSHOE - Winterize any shoe or boot with STABILicers Overshoe, and keep your feet and ankles warm, dry and protected even when slogging through snow, sleet, and slush. SUPERIOR TRACTION - Full-sole coverage with heat-treated cleats on heel and forefoot provides full foot slip protection and traction throughout your natural stride. Traction tread outsole and cleats simultaneously contact the surface, providing superior grip on ice, snow, and wet pavement. If you have any questions about this product by STABILicers, contact us by completing and submitting the form below. If you are looking for a specif part number, please include it with your message.